Sonos Play 1 Black Compact Speakers Pair (2). Condition is Used. I upgraded to Sonos One. The play 1 are in perfect condition and were used up to this point. Sonos Playbar Sound Bar. Condition is New. Shipped with USPS Priority Mail. Fully tested and working. Factory reset and ready to use. 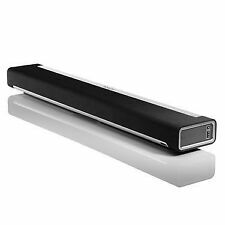 Sonos Playbar Sound Bar Box ONLY with styrofoam inserts and soft cloth.. Condition is New. Shipped with USPS Priority Mail. Includes Sonos One speaker, power cord, flat Ethernet cable, QuickStart guide. Sonos One seamlessly syncs voice, app, and touch commands, enabling you to manage music with a single word, tap of the app, or swipe of the speaker. This SONOS AMP Wireless Amplifier is for Streaming. It has 125W per channel and it is the Newest Version. It has not yet been opened or used. 2 x Sonos banana plugs. Sonos Amp 250W 2.1-Ch Amplifier. Looks to be in great condition with no blemishes, in original box. No Power Cord is Included. Sonos One Voice Controlled Smart Speaker (Black). Shipped with FedEx Express Saver. Sonos AMPG1US1BLK Specs. Sonos Amp 2.1-Channel 250W Power Amplifier (Black). Sonos App Installed on a Compatible Device. Amplifier Type Class-D. Other Connectors 2 x RJ45 Ethernet LAN. Frequency Response Not Specified by Manufacturer. Condition is Good. Shows very light signs of use. Box has tears and imperfections. Used Limited Edition Sonos Play 1 Blue Note Hi-Fi Speaker. Only 4,100 made in the WORLD! SUB brings out the bass: Combine SUB with PLAYBAR, for even richer low end response. Surround yourself with Sonos rear speakers: For an unmatched wireless 5.1 experience, add a matched pair of Sonos speakers to your PLAYBAR SUB combo. 2 Sonos Play One Alexa Box ONLY, including Dust Custom Molded Packing Spacers and manual Condition is Used but like brand new . Shipped with USPS Priority Mail. I wrap the item with an air cushion. Put it in a plastic bag. Item Title. Our warranty covers all that would be covered by the product manufacturer, however we do not cover faults caused by accident, neglect, misuse or normal wear and tear. This warranty does not cover consumable parts of the item, such as the battery. Sonos One (Black) Smart Speaker New!!! Sonos playbar box with all packing, bags and manual along with the outer shipping box. BOXES ONLY no playbar included!!! !